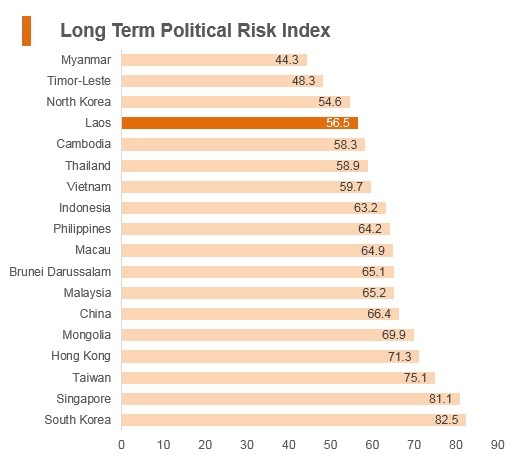 Laos is one of the fastest growing economies in East Asia and the Pacific. It has improved access to electricity, schools and roads, and has become an important energy exporter. However, the country continues to face a challenging macroeconomic situation in the near term. 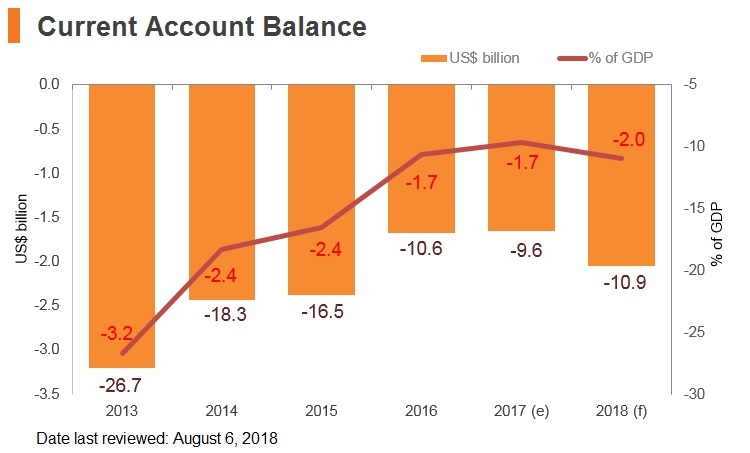 The fiscal deficit remains high, limiting the fiscal space and keeping public debt levels elevated. Growth is expected to further ease slightly in 2018 as current trends continue, before picking up in 2019-2020, supported by increased power generation and growing opportunities in the non-resource sectors from closer regional integration and reforms to improve the business environment. National Assembly at its five-year congress appointed Bounnhang Vorachit as president and leader of the ruling Lao People's Revolutionary Party (LPRP), succeeding Choummaly Sayasone, who has served as the ruling party's General Secretary and President of Laos from 2006. Former US President Barack Obama became the first sitting US president to visit Laos. US commited USD90 million dollars over three years to help clear unexploded bombs that the US dropped on Laos during the Vietnam War. Construction of the China-Laos railway officially began. This is a 417 km railway which will stretch from the Boten-Mohan border (between Laos and China) ending in Vientiane when completed. Lao PDR became the 158th WTO member on February 2, 2013. Laos' trade policies prioritise the protection of local industries. The average trade tariff rate in the country is 5.2%. Individual companies in the petrochemical industry are required to file an annual import plan. The government controls the retail price and profit margins of gasoline and diesel, which weakens profitability and flexibility in this sector. Other goods prohibited for import and export range from explosives and weapons to certain forestry products and wildlife. In May 2016, Laos Prime Minister Thongloun Sisoulith issued a moratorium on the export of logs and timber in order to decrease the pervasive shipments of illegally obtained logs, timber, processed wood, roots, branches, and trees from natural forests. Despite the moratorium, illegal timber sales continue with the support of local governments in Laos. There are allegations that provincial governors are profiting through the management of sawmills and trade with neighbouring Vietnam. Association of South East Asian Nations (ASEAN): The ASEAN Free Trade Area (AFTA) is a trade bloc agreement supporting local manufacturing in all ASEAN countries. 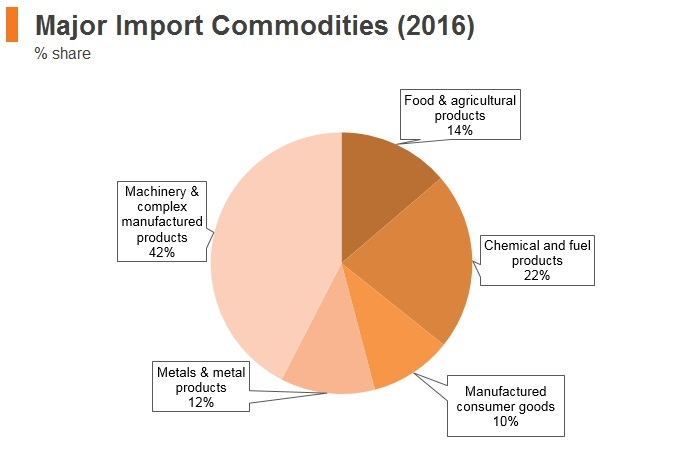 Laos benefits from increased regional integration and tariff liberalisation that includes the elimination of import duties in various sectors and classes of goods and maximum tariffs of up to 5% between members. 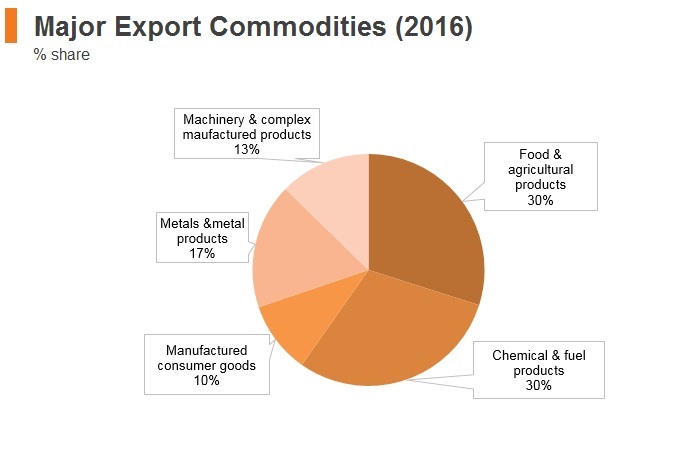 These factors will help reduce input costs for businesses and will increase the country's exporting capacity and industrial base in the long term. The 10 member states are Brunei, Indonesia, Malaysia, Philippines, Singapore, Thailand, Myanmar, Cambodia, Laos and Vietnam. 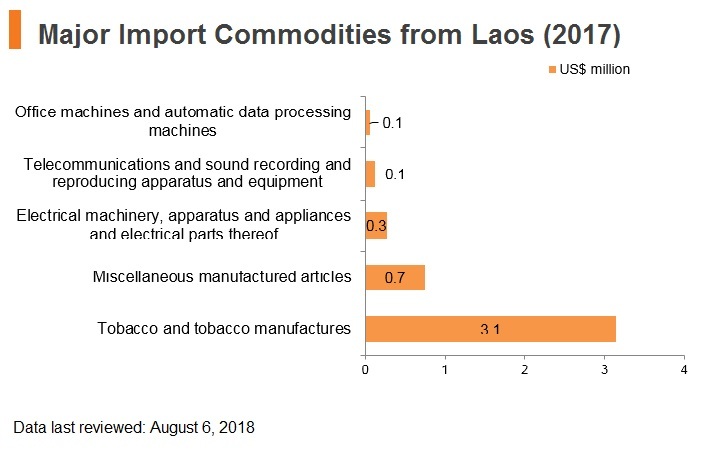 Exports from Laos destined to these markets are subject to 0% tariff rates for most agricultural and industrial products, except for those under the General Exception List (GEL) as well as under the Sensitive List (SL) exporting to newer ASEAN members (Cambodia, Myanmar and Vietnam), which will be cut to a 0% rate by the end of 2018. Being a member of ASEAN also opens the economy to other significant trade agreements with key regional markets, such as China and India. Thailand-Laos Partial Scope Agreement: Laos benefits from a preferential trade agreement in terms of tariff exemption or reduction under the Laos-Thailand Preferential Trading Arrangement. Thailand is an important market for Laos, serving as the country's second-largest export destination, and largest import source. 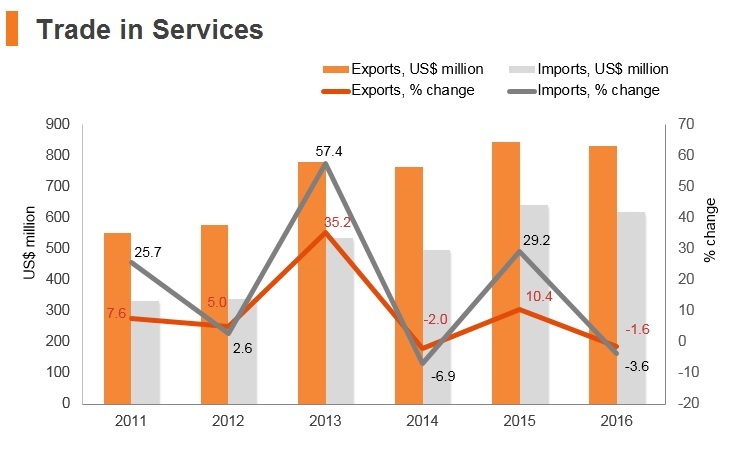 ASEAN-China Free Trade Agreement (ACFTA): Trade relations between Laos and China benefit from trade preference in terms of tariff exemption or reduction under ACFTA. China is an important market for Laos; it is the country's major trading partner and an important source of investment. There are also ongoing negotiations about the Regional Comprehensive Economic Partnership (RCEP), which is a regional economic agreement being negotiated between the ASEAN governments and their six FTA partners: Australia, China, India, Japan, New Zealand and South Korea. The RCEP would lower tariffs and other barriers to the trade of goods among the 16 countries that are in, or have existing trade deals with the ASEAN. Unlike the TPP and other US-led trade deals, however, the RCEP wouldn't require its members to take steps to liberalise their economies, protect labour rights and environmental standards and protect intellectual property. 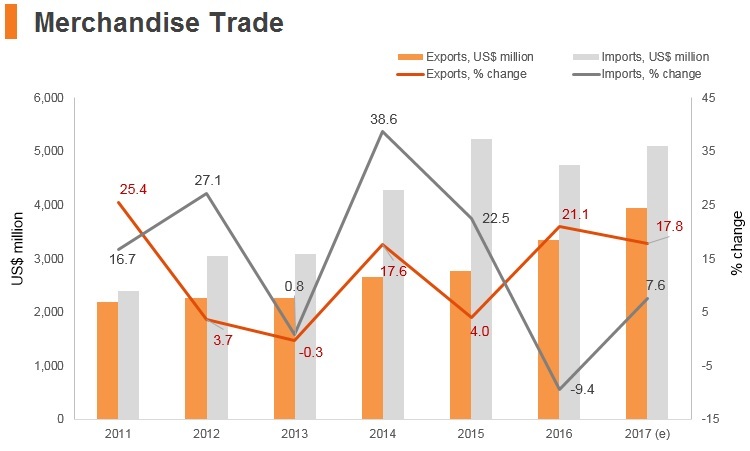 ASEAN-Japan Free Trade Agreement (AJFTA): Trade relations between Laos and Japan benefit from trade preference in terms of tariff exemption or reduction under the AJFTA. Japan is a large developed market and one of Laos' major trade partners. ASEAN-Korea Free Trade Agreement (AKFTA): Laos benefits from trade preference in terms of tariff exemption or reduction under the ASEAN-Korea Free Trade Agreement (AKFTA), which is a trade bloc agreement between South Korea and ASEAN. ASEAN-India Free Trade Agreement (AIFTA): Laos benefits from trade preference in terms of tariff exemption or reduction under the AIFTA, which is a trade bloc agreement between India and ASEAN; this will help Laos in terms of trade growth and diversification given the size and performance of the Indian economy and other ASEAN member states. 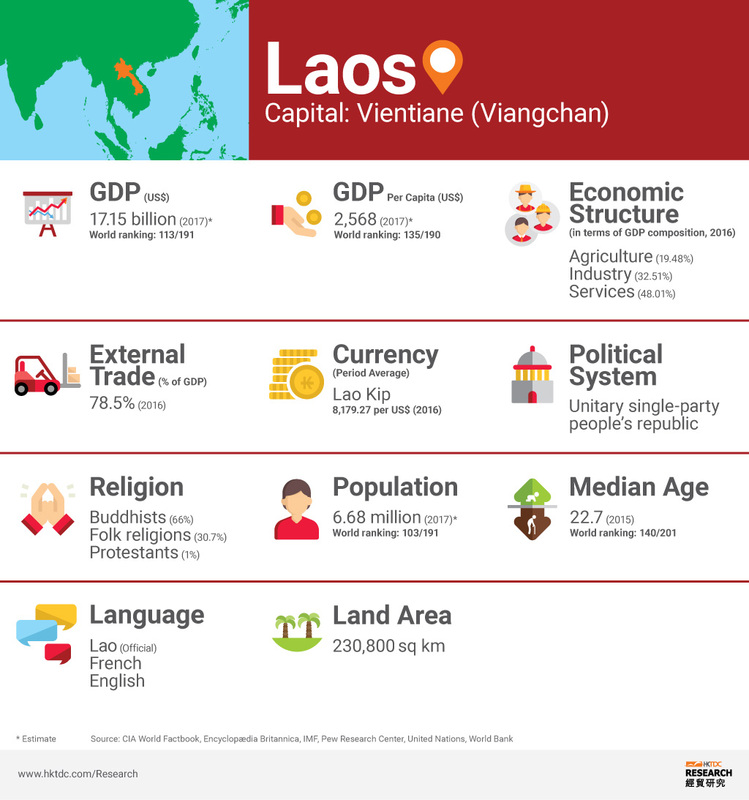 Laos-Vietnam Border Trade Agreement: Apart from ASEAN, Laos also benefits from reciprocal access under the trade agreement between Laos and Vietnam for 32 tariff lines with 50% of the AFTA rate, while all other products are 0% rate, except for 155 tariff lines which fall under the GEL of Vietnam. 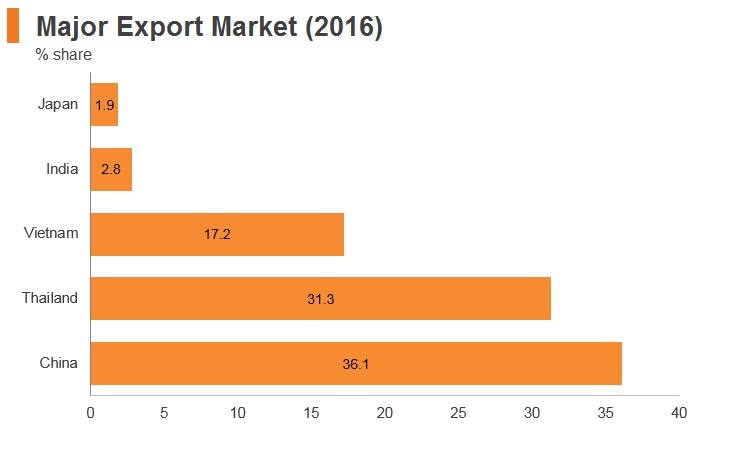 Vietnam is a high-growth developing market and Laos' third highest import source and export destination. ASEAN-Australia-New Zealand Free Trade Agreement and Economic Integration Agreement (Effective date: January 2010): The Agreement aims to eliminate tariffs on 99% of exports to key ASEAN markets by 2020. The Laotian Investment Promotion Department (IPD) promotes FDI and evaluates foreign investment proposals. Laos has set up various special economic zones (SEZs) in the country, offering benefits like profit tax and value added tax reductions. The Law on Investment Promotion stipulated uniform business registration requirements and tax incentives for foreign and domestic investors. Government also provides special incentives for the prioritised sectors, including tourism, telecommunication and education. 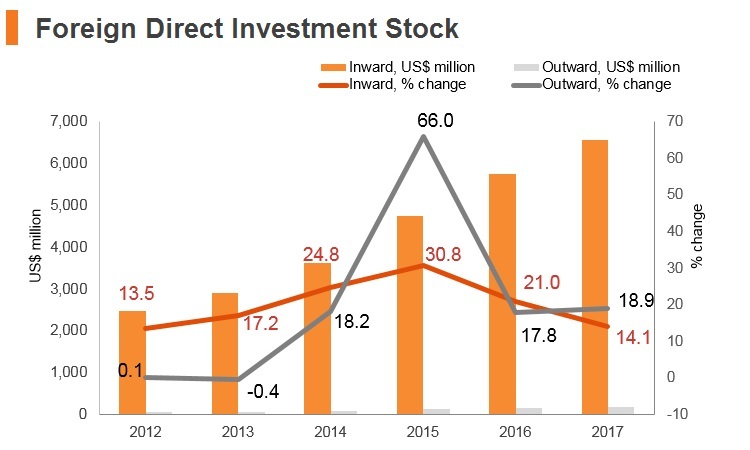 According to the 2009 Law on Investment Promotion, foreign and domestic investors are entitled to equal treatment and incentives within the market, though a few foreign companies have reported evidence to the contrary. Similarly, the 2010 Law on Investment Promotion states that foreign and domestic investors are offered the same tax incentives and business registration procedures. Investment incentives for foreigners vary according to industrial sector and activities, as well as the level of infrastructure and socio-economic development in specific geographic zones. According to Articles 49, 50 and 51 of the Law on Investment Promotion, the government defines industry, agriculture, services and handicrafts as promoted activities. Laos divides its investment promotion into three levels (1 - high; 2 - medium; and 3 - low) and three zones with associated tax incentives. Under the 2010 Prime Ministerial Decree 443 on Special Economic Zones and Specific Economic Zones (SEZs), foreign investors are also encouraged to invest in the country's various economic zones. 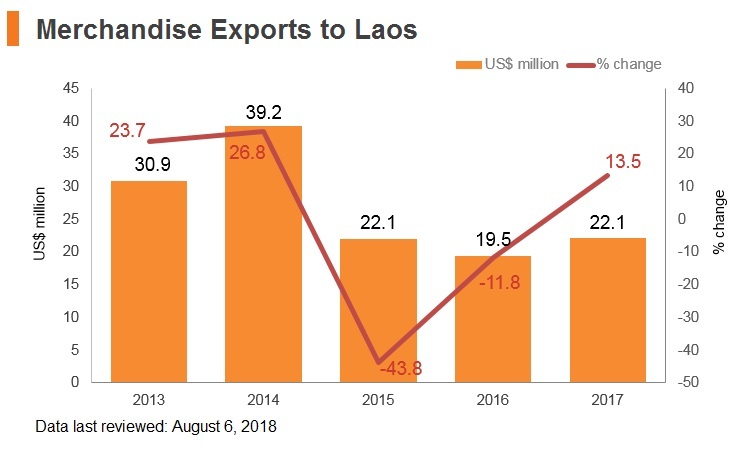 Foreign investors seeking to establish operations in Laos are typically required to go through several onerous steps prior to commencing operations. In addition to an investment license, foreign investors are required to obtain other permits, including; an annual business registration from the Ministry of Industry and Commerce; a tax registration from the Ministry of Finance; a business logo registration from the Ministry of Public Security; permits from each line ministry related to the investment; appropriate permits from local authorities; and an import-export license. Obtaining the necessary permits can pose a challenge, especially in areas outside the capital. The overall administrative burden, also for start-ups, negatively affects investment decisions. Efficiency of procedures in construction and environmental permitting is insufficient while endemic corruption raises risk for investors. In general, Laos has not provided clear processes for investors to complete necessary investment license paperwork. The process is overly complex and regulations are erratically applied. Investors also describe confusion of roles between the ministries, with multiple ministries unexpectedly involved in the approval process. In addition, the lack of substantive regulations on merger and acquisition activities makes such transactions risky. It is difficult to determine which business lines the acquired company is allowed to maintain. Foreign partners in a joint venture must contribute at least 30% of the company's registered capital. Throughout the period of operation of a foreign enterprise, the local assets of the enterprise must not be less than its registered capital. The exploitation of natural resources of generation of energy requires a joint venture with a local party. Individual companies in the petrochemical industry are required to file an annual import plan. The government controls the retail price and profit margins of gasoline and diesel. Foreign individuals and entities are unable to own land in Laos, though may obtain extended leases of up to 99 years in some circumstances. There are also local equity ownership requirements in the areas of beer and other alcohol production, as well as the production of medicine and wholesale of beverages, tobacco, clothes and machinery. 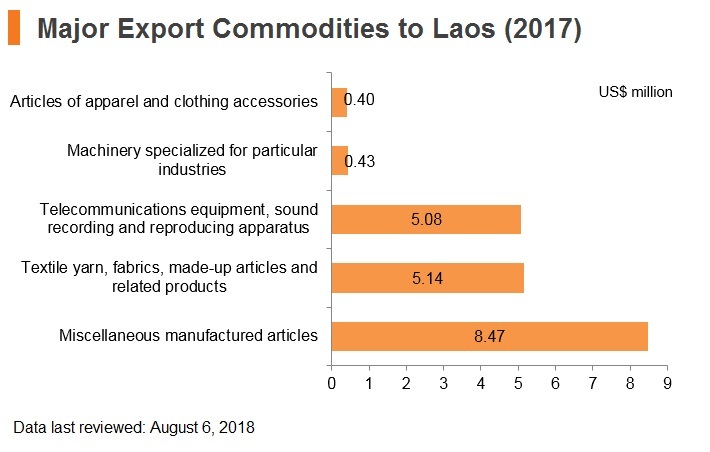 Laos does not allow for investors to participate in the security and defence industries, funerals and related services, religious education, manufacturing of cultural products that are damaging to national culture, chemical substances and industrial waste that may be hazardous to human health. Foreigners are also prohibited from producing a number of Lao cultural handicrafts, as well as from fishing and operating fish farms (unless certain conditions are met). The mining industry's future remains unclear as the negative environmental effects of mining activity worsen. In 2012, the government issued a moratorium on new mining ventures, and announced in November 2016 that it was considering a permanent ban on new projects in the sector. 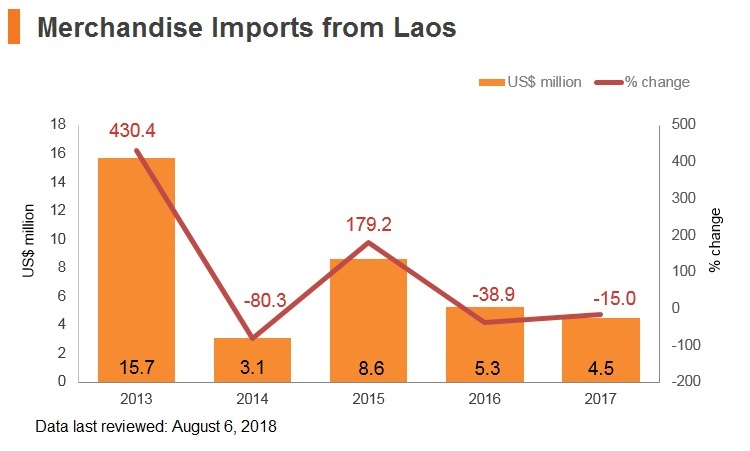 It is unlikely that this will be the case as Laos is heavily dependent on rents from the industry, but potential investors should expect increased regulatory oversight. Zone 1 - Mountainous, plateau zones with no economic infrastructure Under the 2010 Prime Ministerial Decree 443 on Special Economic Zones and Specific Economic Zones (SEZs), foreign investors are encouraged to invest in the country's various economic zones. 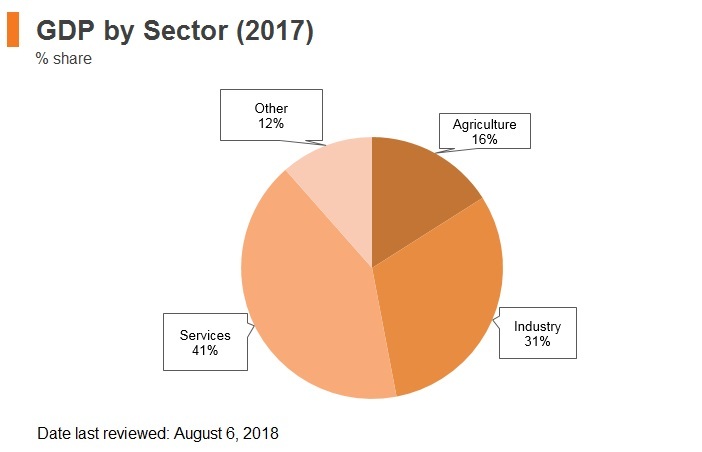 According to Articles 49, 50 and 51 of the Law on Investment Promotion, the government defines industry, agriculture, services and handicrafts as promoted activities. Laos divides its investment promotion into three levels (1 - high; 2 - medium; and 3 - low) and three zones with associated tax incentives. The government also offers incentives for the education and healthcare sectors in the form of land lease exemptions or land concessions, ranging from three to 15 years depending on the zone. - Level 1 investments receive profit tax exemptions for 10 years, Level 2 investments for six years and Level 3 investments for four years. - The government also offers incentives for the education and healthcare sectors in the form of land lease exemptions or land concessions for 15 years. - Exemption from profit tax in the next accounting year, if the net profit derived from business activities is used for business expansion. - Exemption from import duties are applicable for the importation of raw material, equipment, spare parts and vehicles which are directly used for production. - Exemption from export duties for exportation of general goods and products. - If an investor suffers losses after completion of tax finalization with the tax office, the investor shall be permitted to carry the losses forward to three consecutive accounting years. Zone 2 - Mountainous, plateau zones with a moderate level of economic infrastructure Level 1 investments receive profit tax exemptions for six years, Level 2 investments for six years and Level 3 investments for two years. The government also offers incentives for the education and healthcare sectors in the form of land lease exemptions or land concessions for 10 years. Exemption from profit tax in the next accounting year, if the net profit derived from business activities is used for business expansion. Exemption from import duties for the importation of raw material, equipment, spare-parts and vehicles which are directly used for production. Exemption from export duties for exportation of general goods and products. If an investor suffers losses after completion of tax finalization with the tax office, the investor shall be permitted to carry the losses forward to three consecutive accounting years. Zone 3 - Mountainous, plateau zones with good economic infrastructure Level 1 investments receive profit tax exemptions for four years, Level 2 investments for two years and Level 3 investments for one year. Profit tax exemptions in all zones start from the date the enterprise commences operations. The government also offers incentives for the education and healthcare sectors in the form of land lease exemptions or land concessions for three years. According to Notification No. 0824/NSSFO of the Ministry of Labour and Social Welfare, the basic amount for the Social Security Scheme calculation changed from 2 million Lao kip (LAK) to LAK 4.5 million starting from January 1, 2017. The passage of the revised State Budget Law (SBL) in December 2015 should help to strengthen public financial management in Laos over the coming years. According to the Ministry of Finance, the revised law, which will became effective in 2017, will help to strengthen the authority of the National Assembly in budget oversight as well as enhance the capacity of the Ministry of Finance in budget management. Greater fiscal discipline and monitoring as well as improving regional integration will have positive implications for the tax burden that firms and individuals in the country face. Employers are required to give priority to Lao nationals. To employ foreign nationals, approval must be obtained from the Ministry of Labour and Social Welfare. Companies must make a proposal through the Skills Development and Employment Department of the Ministry of Labour and Social Welfare, or through labour sections of provinces or municipalities, to utilise foreign employees. 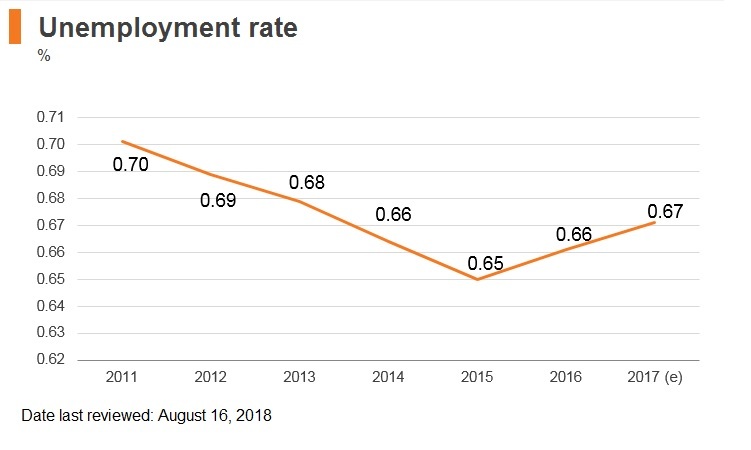 The total percentage of foreign workers as a proportion of the total workforce is capped at 10% and 20%, for foreign workers undertaking menial labour and for professionals with specialised skills respectively. Foreign workers are allowed to enter into employment agreements for an initial period of 12 months, renewable for another 12 months. The period of employment for a foreign worker in Laos cannot exceed five years in total. Depending on the expertise of the employee and the requirements of the business, employers can request from the Labour Administration Authority a foreign worker to continue working for another additional period, which cannot exceed five years. Foreign workers are legally required to have a valid employment visa and work permit before commencing work in Laos. A sponsor is required from a locally licensed and incorporated entity in order to apply for work permits. There are different types of work visas issued in Laos. A labour visa (LA-B2) is the most common type held for purposes of living and working in Laos. Work visas may be valid for a period of 3-, 6- or 12-month durations and may also be renewable for a total period not exceeding five years. Laos is one of the countries with a very open visa policy. Japanese nationals and nationals of ASEAN member states do not require a visa to enter Laos (for a maximum stay). Many nationals of many other countries can be issued a visa on arrival. However, nationals of a few other countries are not eligible for a visa on arrival and must secure one in advance before arrival. 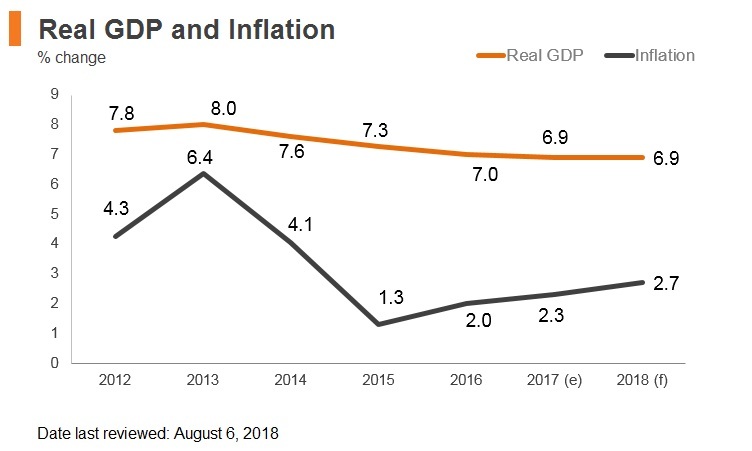 The country's high level of external debt (which stood at around 96% of gross national income [GNI] in 2014), and poor fiscal health resulting from the public sector wage increments in FY2012/13 (October 1- September 30) and FY2013/14 are acting as a significant drag. 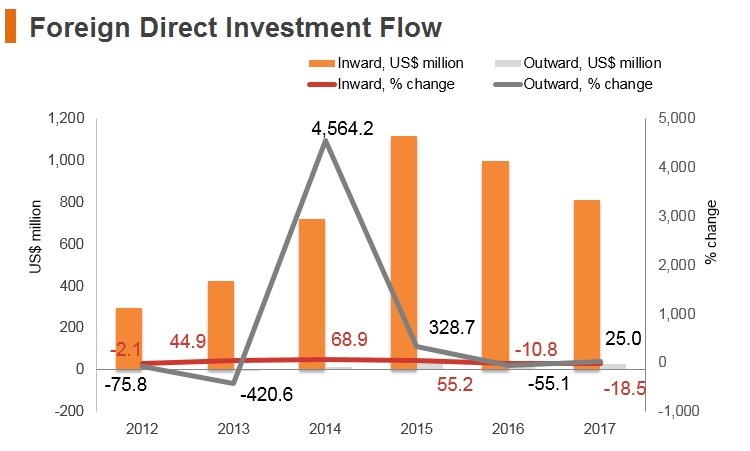 That said, ongoing efforts by the Laotian government to attract foreign direct investment (FDI) inflows to the hydropower and tourism sectors will keep the economy on a strong growth trajectory over the coming years. 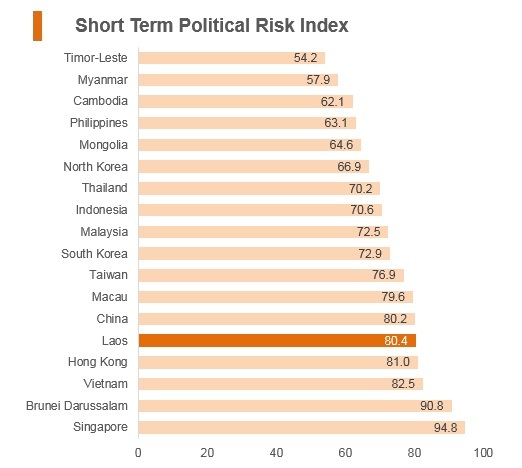 Laos' long-term economic risk outlook reflects the government's poor track record of managing its expenditure, the elevated external debt stock, as well as a rather underdeveloped financial system in the country. 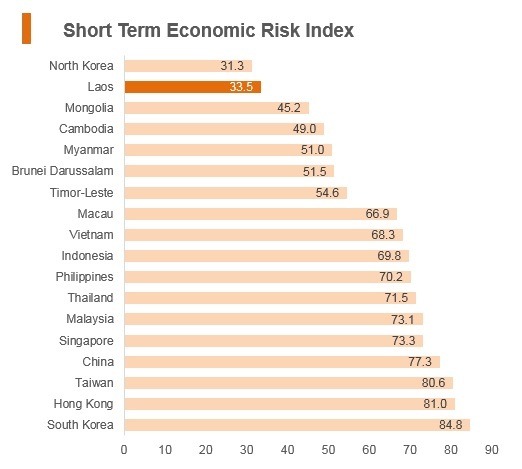 At the same time, a narrow economic base also poses risks to the country's ability to sustain its economic growth momentum. 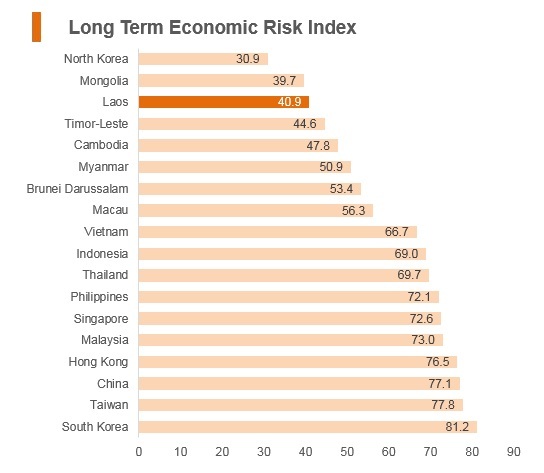 As a developing state that is still in the process of implementing investor-friendly reforms and regional economic integration, Laos poses a number of pertinent operational risks to businesses. The small and largely undiversified labour market suffers from limited skills development, characterised by low literacy and weighed down by underfunding and endemic poverty, particularly in rural areas - resulting in a dearth of skilled labour in the country. 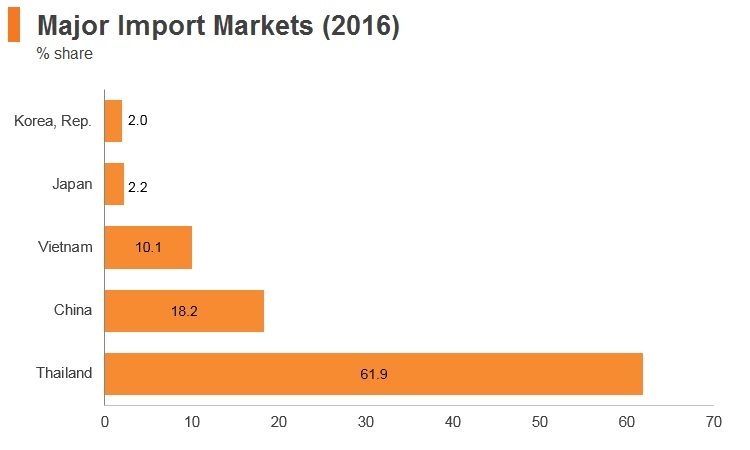 The transport network is underdeveloped and inefficient and relies heavily on a poor-quality road system and limited alternative freight options, further increasing logistics costs, which are already elevated due to burdensome trade bureaucracy and high fuel costs. Laos has a Bilateral Investment Treaty with China that entered into force on June 1, 1993. Laos has a Double Taxation Agreement with China that has been applicable since January 1, 2000. The main activities of HKAECF is to contribute to the fostering, promoting and facilitating of economic cooperation between Hong Kong and the 10 member countries of ASEAN (“1+10”), and between the ASEAN region and the PRC (“10+1”) with Hong Kong serving as a high value-adding and facilitating key international hub, bridge, connector, promotor and investor. Visa application has to be submitted by hand to the consulate. Electronic submission will not be accepted. HKSAR passport holders can apply for a visa upon arrival at Lao International Airports or Lao International border checkpoints for tourist purpose.